Product #15893 | SKU Z-HC | 0.0 (no ratings yet) Thanks for your rating! The Zacuto Half Cage mounts onto 15mm rods in front or behind your camera, independently of the camera or baseplate, and leaves one side of the camera completely open. On the side it does cover, it features a hand-fitting, maple wood handle, fifteen 1/4" accessory threads, and a single 15mm rod port perfect for a Zacuto Zamerican Arm articulating arm. A recessed slot near the handle magnetically holds an included Allen key. This key is for tightening the main rod clamp with included screws and for adjusting the cage for compatibility with different cameras. At its most compact, the cage has a clearance of 14 cm". By readjusting four screws, you can increase the clearance to 22.9 cm -- the top and bottom portions simply get separated further from each other. 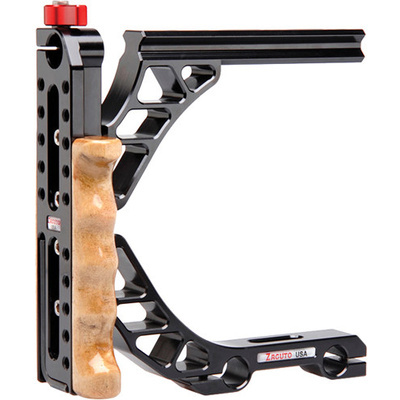 The top portion of the cage is a double-sided Z-Rail that supports a Zacuto QR Handle top handle, Zacuto Axis Mount EVF mount, and various other Z-Rail compatible accessories, including NATO, Picatinny, SWAT, RED, and Wooden Camera rail accessories. The double sided aspect will let you attach these accessories on top or under-slung.